Here at Chielpegian·Cobb, we believe that the practice of law is a profession, and to us that means always putting the needs of our clients first. Our goal is to be the preeminent Fresno law firm by providing unmatched expertise and service in finding cost-effective and practical solutions to our clients’ legal issues. Founded in 1979 as the Law Offices of Elliott D. Chielpegian, and more recently known as Chielpegian Law Offices, Chielpegian·Cobb has served the residents of the San Joaquin Valley - and much of the rest of California - for nearly 40 years. Since inception, our mission has been to provide exemplary legal representation at a reasonable cost. Whether a litigation, transactional or estate planning matter, our primary focus is to assist our clients in vindicating their rights, avoiding and/or addressing problems, establishing and properly conducting their business operations and/or providing for their heirs upon their passing. 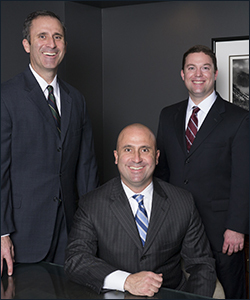 Our firm currently consists of three attorneys: Michael Chielpegian, Mark Chielpegian and Lee Cobb. All three are AV rated by Martindale-Hubbell, the preeminent legal publication. This means that, as determined by other lawyers and judges in the area, Messrs. Chielpegian, Chielpegian and Cobb have all been deemed to practice law with the highest possible degrees of skill and integrity. Thank you for visiting www.chielpegiancobb.com. We encourage you to review our site and, should you ever require legal representation, to contact us to schedule an appointment.